This week we're looking at authors we admire (because we all have favourite authors, right?). 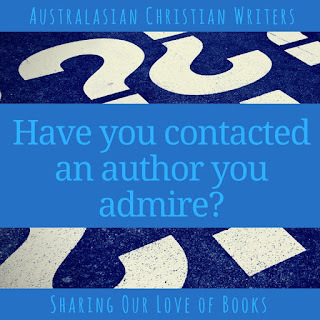 Have you Contacted an Author you Admire? If so, who? What was their response? Let's chat! Have you contacted an author you admire? I loved My Stubborn Heart, and I love Becky Wade's writing. It's great she wrote back! Yes several. The first was Gilbert Morris by snail mail. I was so excited when he replied. He also sent a list of all his books and a photo. I wrote back and we exchanged a few letters. He was a wonderful man. I have contacted many authors via email after reading books. Jenny, Gilbert Morris was a prolific author. I'm impressed he had time to read and respond to his mail given the number of books he published! One wonderful thing about social media is the ease of accessing authors. It makes it so much easier for we readers to encourage an author with kind words. I do get a little frustrated with some of the 'big-name' authors who are hard to contact. Even though they may have a social media presence it is often managed by their pub or manager so you're having to communicate via an intermediary so one is never sure if one's encouragement actually gets to the author. I had this issue when I wrote via the publisher to a couple authors I used their snail mail address but the letter was returned address unknown. I also hate when an author has a website with not contact info so even if you want to contact them you are unable to.